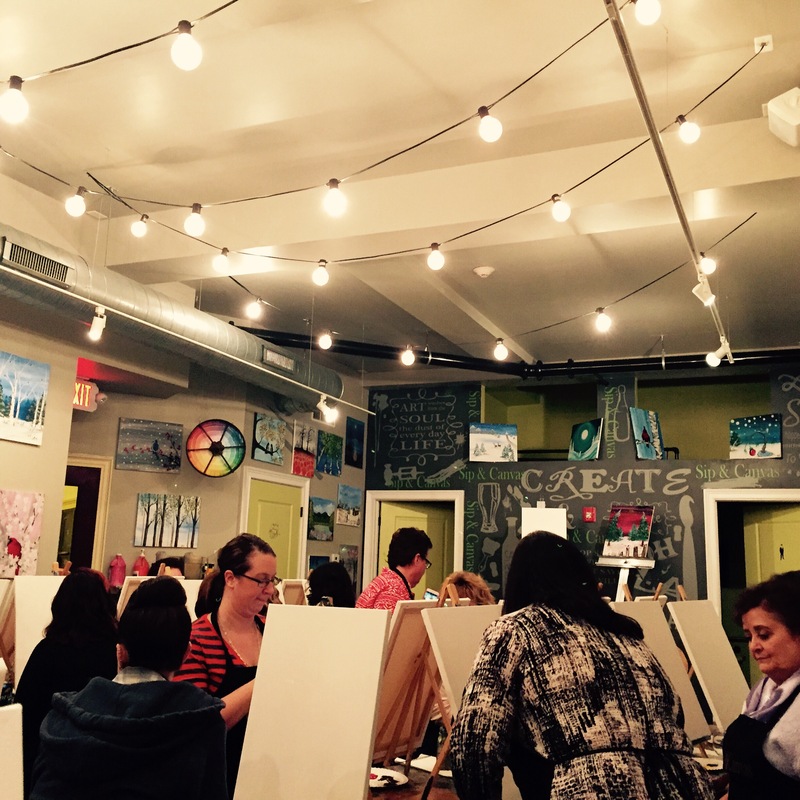 Last Saturday I went with some friends to my local paint and sip, a place where mostly women congregate to create a kind of paint-by-instruction piece and drink at the same time. I’m sure the wine and beer are meant to help loosen everyone’s creative inhibitions, but I also think they can end up making the paintings look a lot better by the end of the night. A few years ago I went to another one of these gatherings, that was my first effort. The painting I finished was terrible, and though I couldn’t bring myself to throw it out, it’s been banished to the back of an upstairs closet, never to bee seen again in my lifetime. Maybe after I’m dead, someone will find it and think it’s worth something then. Although somewhere out in the world there are twenty more almost just like it, canvases filled with multi-colored stripes and patterns on a bright orange background. I can’t think now how anything other than a glass or two of wine and the camaraderie of my friends would have made it appear at all attractive. I think the concept of these places is wonderful, really, getting people out and encouraging them to try painting. You get to hang out with your friends, have a drink, do something fun, and hopefully relax – a much needed creative time-out from otherwise stressful and busy lives. I think even a few people might discover they really like it and go on to paint more. Except for one of my friends, who could barely sit through the end of the evening and made me swear never to let her try anything like that again. The wine didn’t help her at all. But I think she’s an exception to the rule, an anomaly of the usual experience. And while I enjoyed the evening– going out with my friends, relaxing, laughing, being social, with a creative activity to unite us all– I experienced a mixed reaction to the place. I saw the good parts. But I also think they teach a kind of cookie-cutter approach to creating that isn’t very creative: Draw this shape here, use that color there, make a line down the center, etc., etc. It seems to suggest that if you just follow a certain set of rules, follow the right instructions, you will create a piece of art. And I’m not sure if I agree, or how I feel about that idea. It seems sort of wrong. I know that everyone has to start somewhere, take that first step on what may turn out to be a lifelong love of making art. I first started painting from magazine photos in classes as a kid. In hindsight, I’m sure that violated basic artistic ground rules and probably copyright laws, as well. But that’s how I was taught. I began by copying someone else’s work. Even with that thought in mind, I still felt troubled by my reaction to the paint n sip session. Everyone there was making their own version of what the instructor was demonstrating, and no two paintings turned out exactly alike. Yet if you lined them up side by side, for the most part it would be difficult to tell them apart. Maybe it’s just that I’ve been painting on my own for a couple years since that first time, taking classes off and on about once per week, and I felt a bit impatient with the process. It was kind of frustrating because I’m not used to painting that way now, working instead from photographs (I know, another no-no to some people), still-lifes, or plein-aire style (very challenging for several reasons), which I first tried this past summer. So I definitely was coming to the paint n sip with a different perspective and my own set of issues. But still, the idea makes me a bit uncomfortable. I guess I find it to be a kind of creative conundrum, one that I understand but that still gives me the heebie-jeebies. It’s a little like looking at a group of high-school girls who all look, dress and act alike, but who still think they’re each special, unique. My misgivings aside, I guess in the end the ethical questions can take a back seat if everyone just enjoyed the simple process of making art. I think that’s really the point. And if they want to go on someday and make more of their own, they can learn how to do it differently then, in their way, making lines here or there (or not), using blue instead of red however they feel inspired. If I try to look at it in that way, the paint n sip achieves a pretty good goal. This time I came home more pleased with the results of my efforts. Although it’s no Monet, I like my painting a lot more than the other one. And even though it turned out badly, I can’t really complain because that first experience sparked the urge in me again after almost twenty years of not touching a brush or paint for anything other than redoing my walls or refinishing furniture. It took me back to a feeling from my childhood, a place where I felt happy and fulfilled, and helped bring it back into my life again, for which I’m very grateful. Maybe it will end up doing the same for someone else, too. Then one day they can write about their own journey, their struggles growing as an artist, and offer up their vision of the world to share with others, beautiful flowers from a humble, seed-like beginning that started one night when they agreed to go out and try painting with their girlfriends.